Every year we cater to thousands of High School students for Prom, Homecoming and Winter Formal events in Los Angeles and Orange County. There isn’t a better way to travel than our fully loaded party buses! We can accommodate small groups from 15, all the way up to large groups of 50 in our biggest vehicles. Why Choose Party Bus Group for Your Prom, Formal or High School Event? Renting out one of our luxurious party buses is the best way to ensure that you’ll get to the event on time and have a blast with all your best friends. From group pictures to the dinner and dance, fast food stops or after prom parties, the party bus will take you anywhere you need to go. No need to try to coordinate rides or navigate, just easy and fun transportation with a luxury party bus rental! Parents, you can feel safe knowing that your young adults will be safely transported to their various destinations by our highly trained professional chauffeurs, in our top of the range vehicles that meet all of the CHP / PUC regulations. Prom is truly an exciting time. It is, in a sense, the passage way from high school to college or a career, and it is the beginning of a new chapter in life. There isn’t a better way to conclude your high school experience than a big celebration with your date and all your friends on one of our Party Buses! 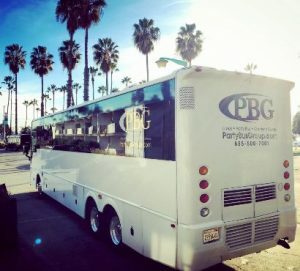 When it comes to planning your high school event, look no further than the Party Bus Group!